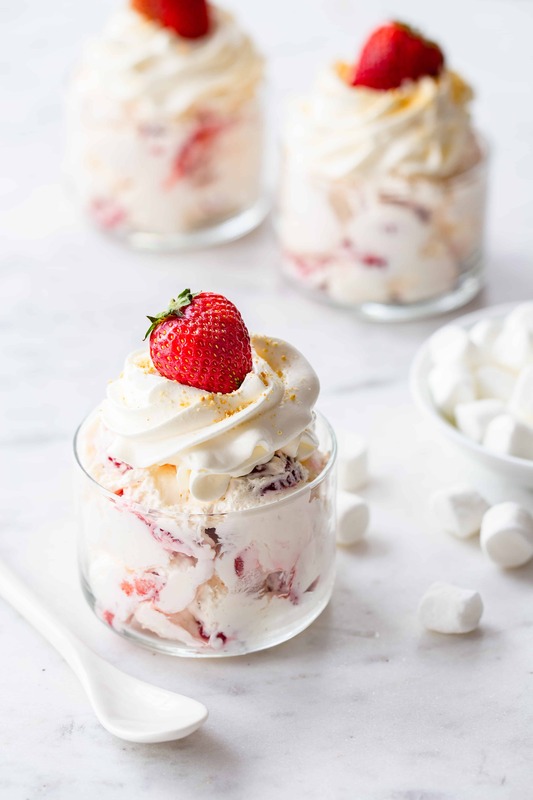 Strawberry Cheesecake Fluff comes together in less than 10 minutes and is the perfect dessert, or side dish for any occasion. The weather in Ohio has had me all kinds of confused. The calendar has me craving things like lemon lime cupcakes and this strawberry cream cheese tart, but the weather has been calling for pumpkin bread and caramel apple blondies. I mean, it is May 1st today, so I’m hopeful that snow flurries and cold snaps are officially going to be a thing of the past. Last week when it was snowing, Elle came downstairs and proclaimed that Mother Nature had a brain fart, yes, sweet babe, yes she did. Fortunately for us, we were able to escape the dreary, cold Ohio weather for the gorgeous weather of the Sunshine State. And let me just tell you, it was in the nick of time because we were all starting to go a little stir-crazy. Just before we left for Florida, we celebrated my Dad’s 60th birthday complete with a menu of his absolute favorites: steak, mashed potatoes with loads of gravy and chocolate cake. Confession though. I didn’t actually make the chocolate cake, I bought it from Costco because I needed to pack, and frosting a cake just wasn’t happening. 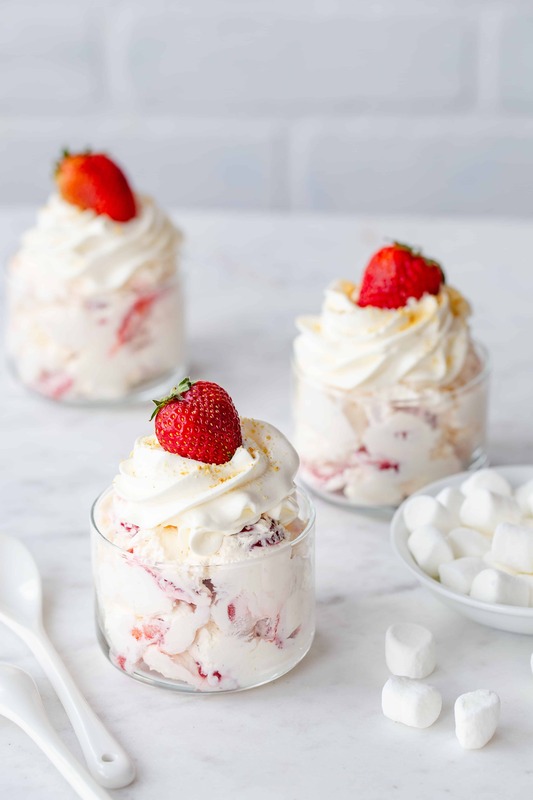 However, I did make this strawberry cheesecake fluff. And in my opinion, it was just as good as the chocolate cake, BUT you guys know I love cheesecake anything. So I might be just a tad biased. If you’ve been following My Baking Addiction for any length of time, you’re probably well aware of the fact that I’m a big fan of fluff too. From cranberry fluff and ambrosia to orange fluff to pineapple fluff, fluffy desserts are one of my favorites. 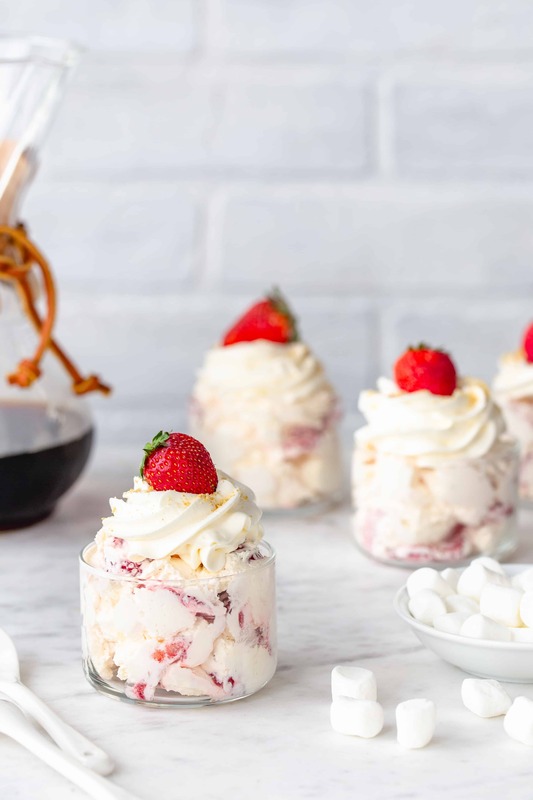 One of the main reasons I love to make fluffy dessert salads like this strawberry cheesecake fluff is because they’re so simple to throw together for a quick weeknight dessert, a barbecue, or a birthday party and they are always a huge hit. Plus they don’t require a bunch of ingredients. 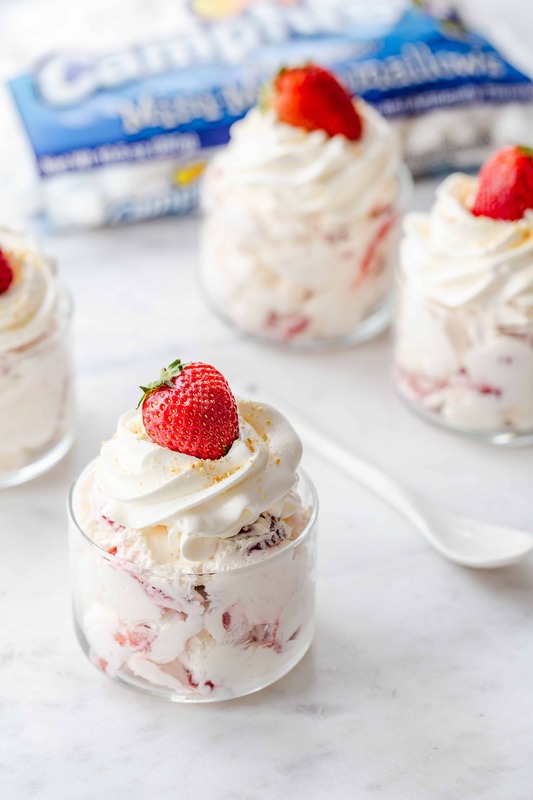 All you’ll need is cream cheese, powdered sugar, vanilla, whipped topping, strawberries, graham crackers and Campfire® Mini White Marshmallows. Because fluff just isn’t fluff without marshmallows. I’ve teamed up with Emily from Jelly Toast and Campfire® Marshmallows to create some amazing marshmallow recipes. We’ve got tons of delicious dishes and desserts from the past couple of years, and so much more to come. 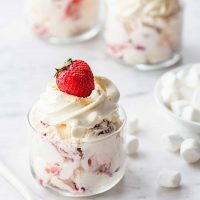 We even created a Marshmallow Madness Pinterest board where we’ve pinned loads of delicious ooey-gooey marshmallow recipes. Just like this strawberry cheesecake fluff, this Nutella s’mores fudge and this s’mores snack mix. 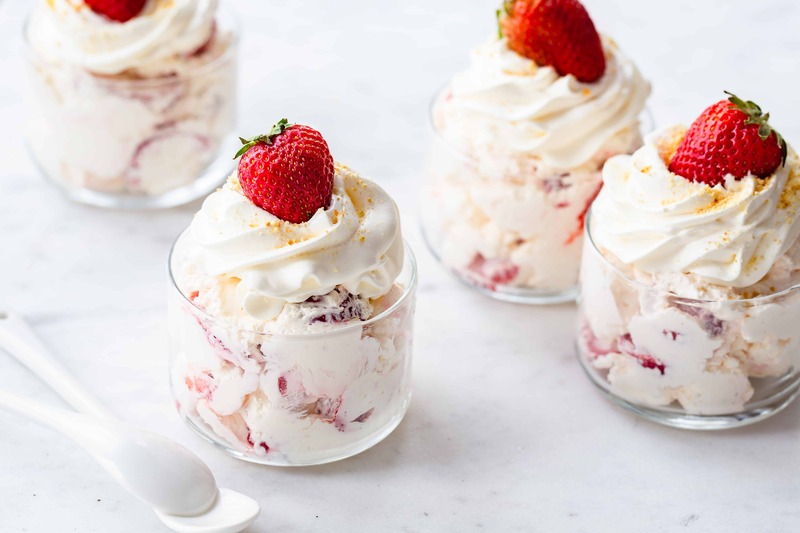 Seriously, whip up this strawberry cheesecake fluff for any occasion and I promise you it will be one of the first things to disappear. And if you happen to have a little leftover, eat it for breakfast with a bit of granola. In the bowl of a stand mixer fitted with the paddle attachment, or in a large bowl with an electric mixer, beat the cream cheese for 3 minutes. Scrape down the sides of the bowl and add in powdered sugar and vanilla and beat an additional 3 minutes.